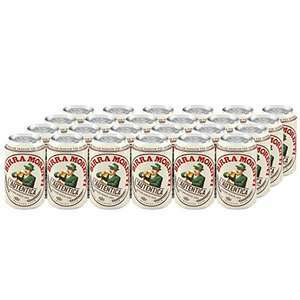 Birra Moretti is a beer which has been enjoyed in Italy since 1859 and is now growing in popularity here in the UK. Whether you've discovered it on an Italian adventure, or here in the UK, it is still brewed to its authentic recipe using the finest ingredients to produce a full bodied lager with a subtle and pleasant bitterness. A beer which is perfect for enjoying alongside tasty food (ideally Italian, of course) or on its own. Salute! Genuine question, how come folks want it more if it's brewed in Italy? …Genuine question, how come folks want it more if it's brewed in Italy? Isn't it better for the economy and the environment if it's produced in the UK (less shipping, more jobs etc)? Good beer, better than peroni. Heat! My favourite to drink. I wouldn't say it's better than Peroni, however it is a very nice drop and I drink it regularly in my spoons. Heat. Still brewed in Italy too... Not Aussie Beer brewed in Liverpool or French …Still brewed in Italy too... Not Aussie Beer brewed in Liverpool or French stuff brewed in Grimsby.... Heat. Case of Moretti bottles that I picked up in Sainsburys recently was brewed in the UK...promptly put it back on the shelf. Hope the cans are different? Cheaper at Asda if non prime. £5 for 6 cans. Case of Moretti bottles that I picked up in Sainsburys recently was brewed …Case of Moretti bottles that I picked up in Sainsburys recently was brewed in the UK...promptly put it back on the shelf. Hope the cans are different? Looking at the pics it says so - I did wonder as when beers get popular here they tend to then move brewing here. Ordered 3 using the top up £50 get a free £5 offer. I wouldn't say it's better than Peroni, however it is a very nice drop and …I wouldn't say it's better than Peroni, however it is a very nice drop and I drink it regularly in my spoons. Heat. Worthless as a Prime deal for me as it won't be delivered until the 20th when I'm out of the country. Everyone else enjoy. Worthless as a Prime deal for me as it won't be delivered until the 20th …Worthless as a Prime deal for me as it won't be delivered until the 20th when I'm out of the country. Everyone else enjoy. How come folks want it more if it's brewed in Italy? Isn't it better for the economy and the environment if it's produced in the UK (less shipping, more jobs etc)? Do they change the recipe, or cut costs or something when they re-locate production? Genuine question! I can't think of a beer I've ever been able to do a before and after test with (as it were). Ah, shame! Seems like a wasted opportunity! I love it, but I won't be here. Blame Prime for not delivering next day or even before the 20th. I love it, but I won't be here. Blame Prime for not delivering next day or …I love it, but I won't be here. Blame Prime for not delivering next day or even before the 20th. Don't understand. Delivery tomorrow for me. Has to be regional. I'm in Devon, just tried again and it says the 20th. This small can craze is a clever way to get more money out of people. Mine arrived today.and made in italy not the uk..